After a very successful shopping trip yesterday, I walked away with a whole fridge full of fresh produce I can’t wait to get my hands on this week. It’s always nice to start eating healthy for the New Year. I am so sick of desserts, I thought I’d never say that! With that said, this doesn’t mean my baking days are over 🙂 I’ll be back baking a little later, but for now, I am thrilled to be cooking some healthier recipes. First up is my Sweet and Spicy Almond Glazed Shrimp. Now, as a fair warning, my kids were not huge fans. This is more of a mommy and daddy type dinner. It is fabulous! I saved some shrimp for the boys without the sauce and they ate it plain. So, whatever works right?! 1. Heat oil in a large pan over medium heat. When hot saute garlic for 15 seconds then add in shrimp. Stir and heat for 2 minutes then add salt, pepper, almond butter, soy sauce, lemon juice and cayenne pepper. Stir to combine ingredients then add 3 Tablespoons water; mix to combine. Reduce heat to low. 2. Cook Basmati rice in rice cooker or according to package directions. When done, remove and mix with chopped cilantro. Season with salt and pepper to taste. 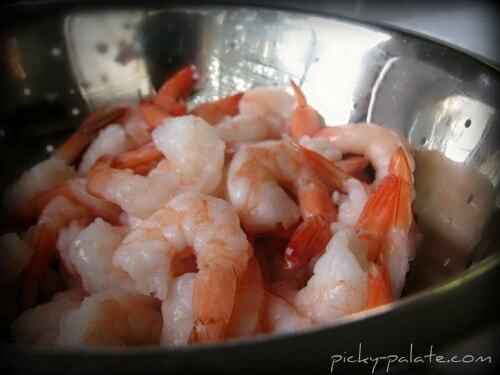 Place rice onto serving plates then top with glazed shrimp. Garnish with a cilantro leaf and serve. Have a great new week! Come back soon for more good healthy cooking! I love anything with cilantro – bet this is awesome! Yum, Jenny! This sounds like something my mom would love. Happy New Year to you guys! Jenny this looks so good. I have a love for shrimp like no other. Happy New Year. Wow, that is a must make- thanks for sharing! I am a huge cilantro fan. Great healthy dish! 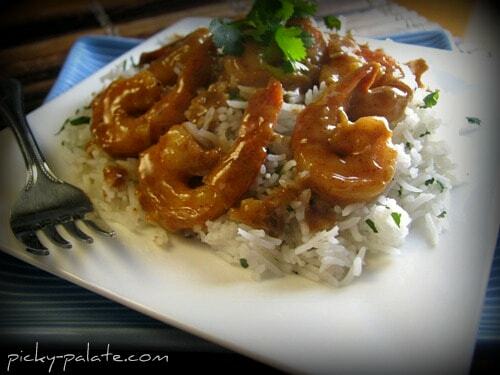 This looks amazing…I think if I use wheat-free soy sauce I could make this. (I have celiac). the honey almond butter sounds delicious, too. would it be possible to just use the almond butter and honey as individual ingredients? This sounds delicious! When I read the title I was wondering what the almond glaze was made of… LOVE the addition of almond butter! Yum! I will have to look for that honey almond butter! This sounds delcious! I am all about the healthy recipes as I have started my training for a marathon in April! So I need all the help I can get! Oh this looks so yummy! I will have to try to find the honey almond butter since we do not have a Whole Foods or Trader Joes. This looks SO good!!! And the perfect kind of light dinner! Jenny, I am a big shrimp fan and this dish looks totally appetizing to me. I’m saving this one to try SOON! P.S. I’m making basmati rice for the first time ever tonight! I dont have kids yet, so no picky kids to worry about! I’m definitely adding this one to my list for next week! There is no seafood love in this home but I’ll definitely give it a go with diced chicken breast! Sounds like something hubby would especially love! Thanks! 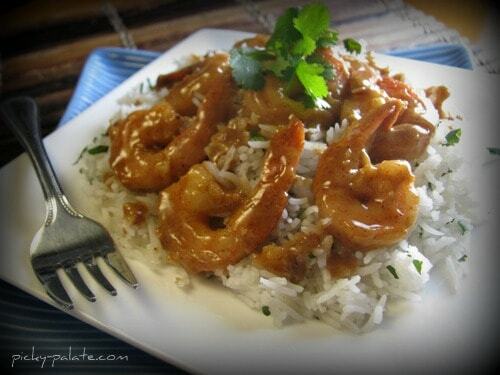 I too love cilantro and the shrimp…yep it’s a fave around our house. I wonder what camera & lens you have? I love your blog Jenny! If you pop over to mine I have an award for you! sounds yummy! for those of us who live in Australia (like myself!) shrimp is prawns! 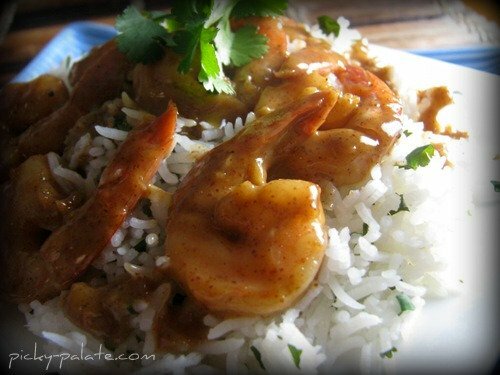 I had some fresh shrimp I bought on the market and was searching for a new recipe I could use them in! This was so SO good! It didn’t make NEAR enough for 4-6 servings (we barely got 2 1/2 smallish servings) so if you need that much, double everything except the rice. The flavor was really good though, and it probably took 10 minutes from start to finish. I also could only find regular almond butter, so I added a few tablespoons of honey and it worked great. That looks amazing. I have never had any type of a nut sauce with seafood, but sure looks great. We’re a group of volunteers and starting a brand new scheme in our community. Your website offered us with helpful info to work on. You’ve done a formidable task and our whole community might be thankful to you.